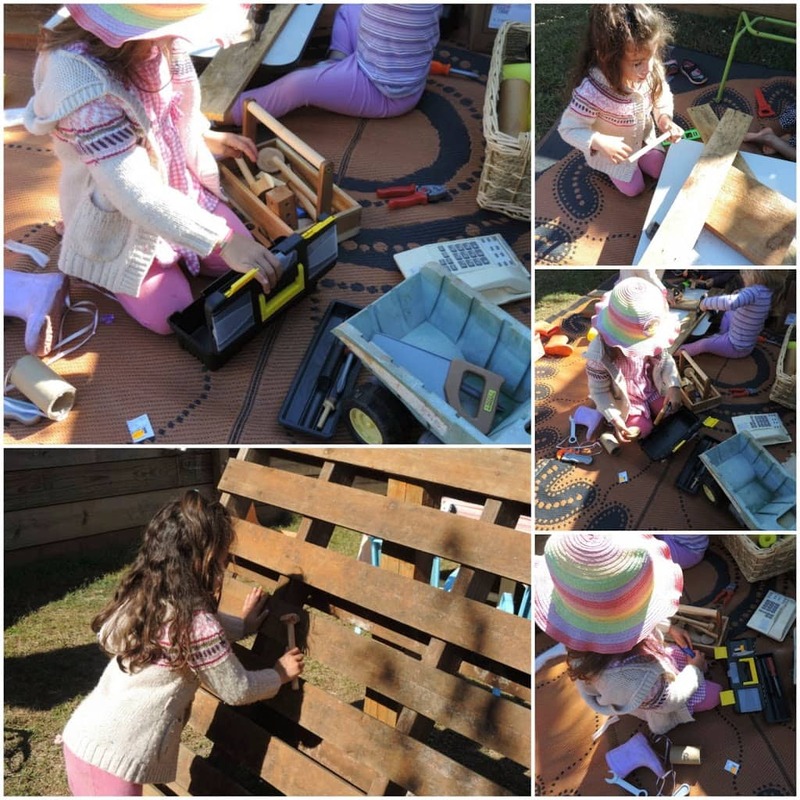 For the past few months my own girls as well as the children attending my family day care service have had a real interest in working and playing with wood and tools. It doesn’t matter whether it is construction, craft, indoors or outdoors there seems to be always something we can do with our toolboxes or some wood! I’ve had to get a little creative in my extension activities to keep them busy but it’s also been interesting to watch what they come up with as well. It’s a good idea when working with kids to remain as flexible in your ideas as you can. Just because I put a box of tools out with some wood doesn’t mean they will use them in the way I intended. I have enjoyed setting out different “invitations to play’ over the last few weeks though for both the toddler and preschool ages. 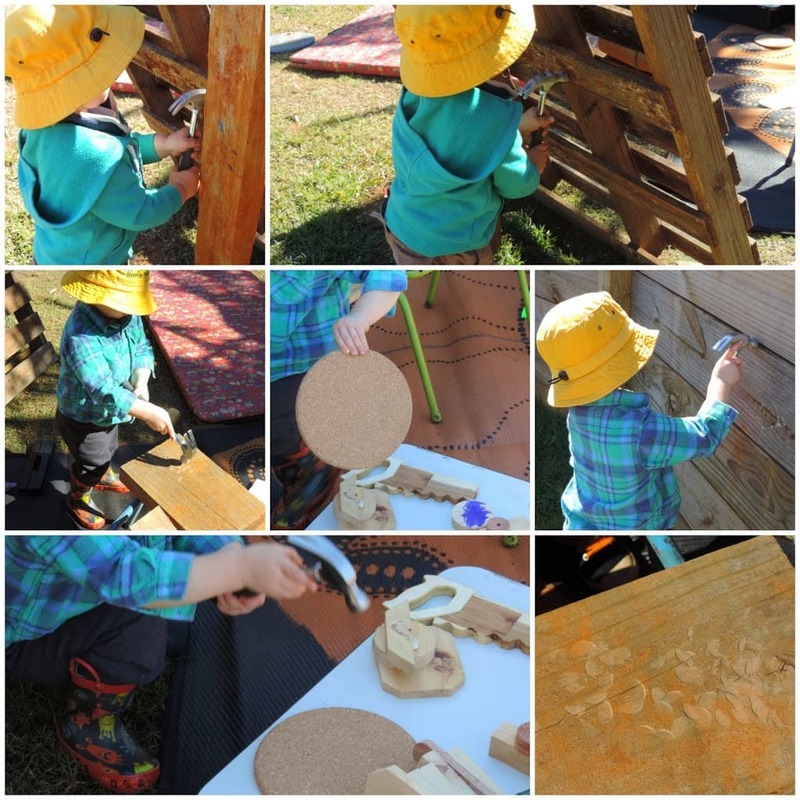 Construction, wood and tools make a great activity base for multi-age groups as they are materials that are easily modified for safety and age and keep a toddler’s short attention span really well as this age loves to figure out how things work! 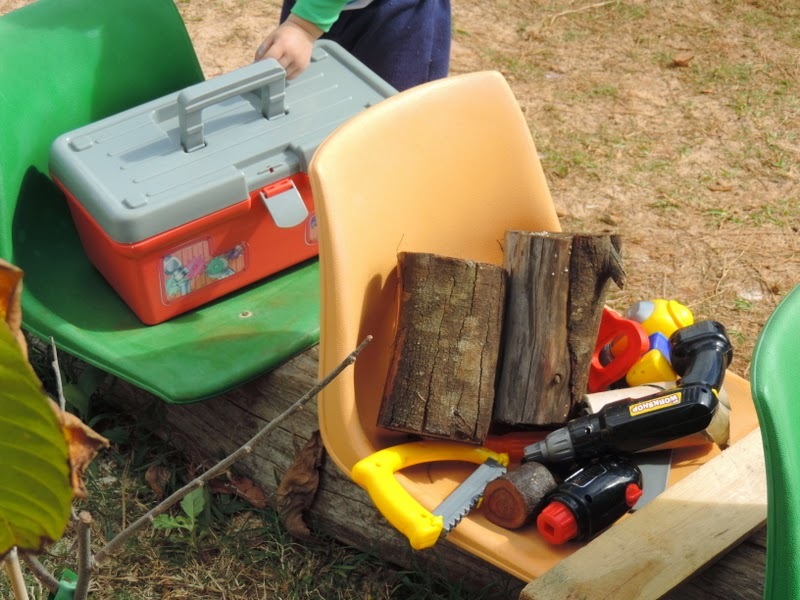 I think it’s important to keep their play props as ‘real’ as possible so they can really engage with how they have seen wood and tools being used in their everyday environment and community. 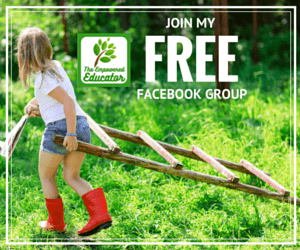 It makes for a fantastic sustainable activity as the children can help you collect branches, wood offcuts and other materials from around the home to use in their construction. 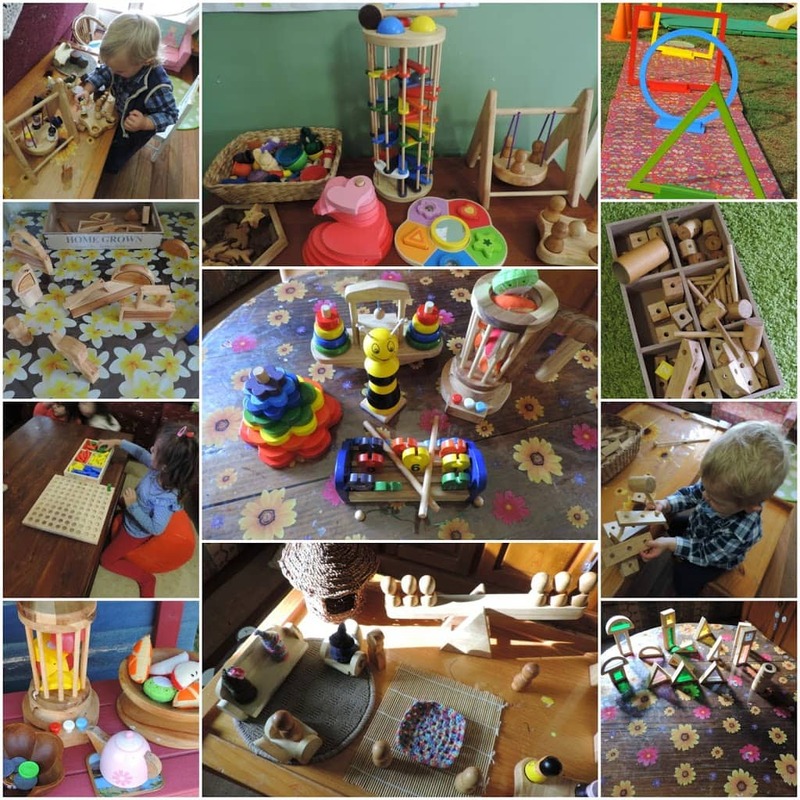 If you are purchasing resources to promote play with wood and other natural materials then I really urge you to choose quality wooden products like QToys offers over the cheap plastic versions. You and the children will get much more use out of them. I’ve also added a few well made and obviously well loved tools from my local second hand market. There’s nothing wrong with having a mix of resources but try and make sure you are buying a quality product for your money. And when you have spent the money make sure you are thinking outside the toolbox (see what I did there?…Hilarious!) 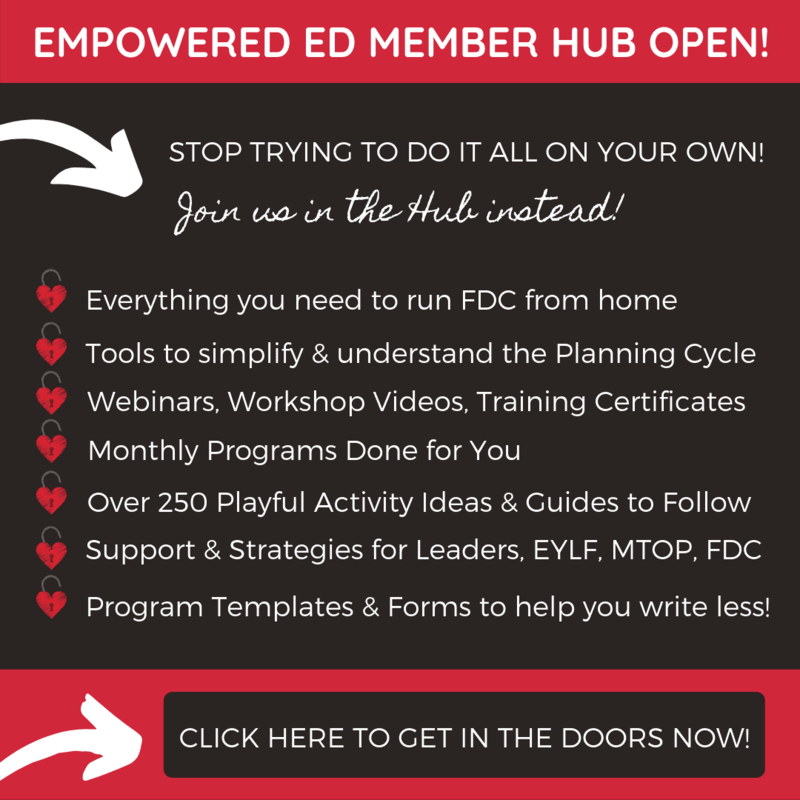 to use those resources in as many ways as possible. Combine them with some second hand favourites and some recycled materials from around the yard and you have all the tools (I know, hilarious aren’t I?) that you need for many hours of fun! Here’s a few ways we have been playing and learning with wood and tools in the last few weeks. I warn you, some of these photos are seriously cute! 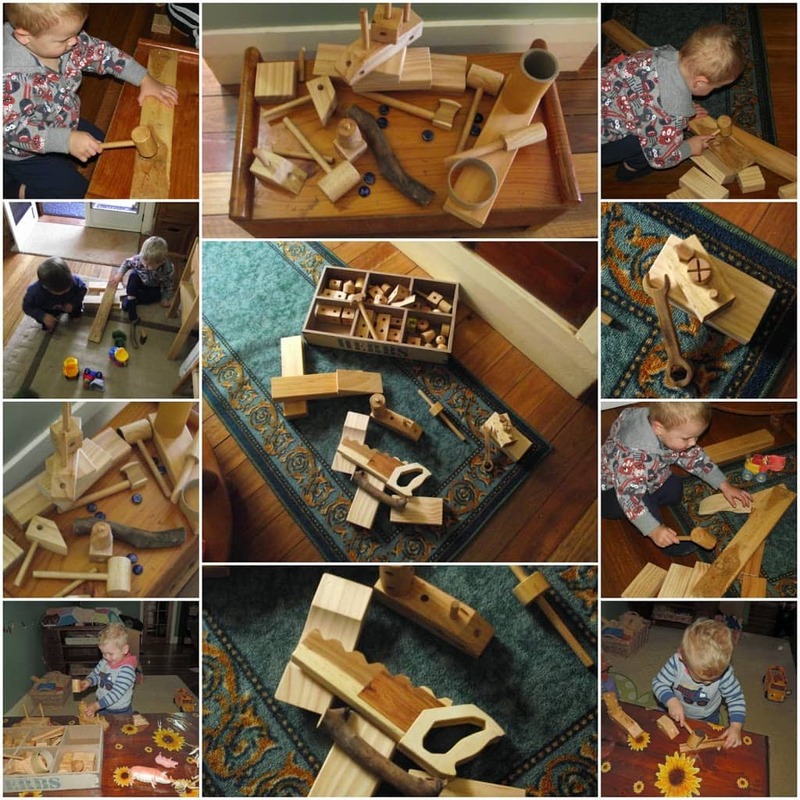 Wood offcuts and glue…fun for all ages! 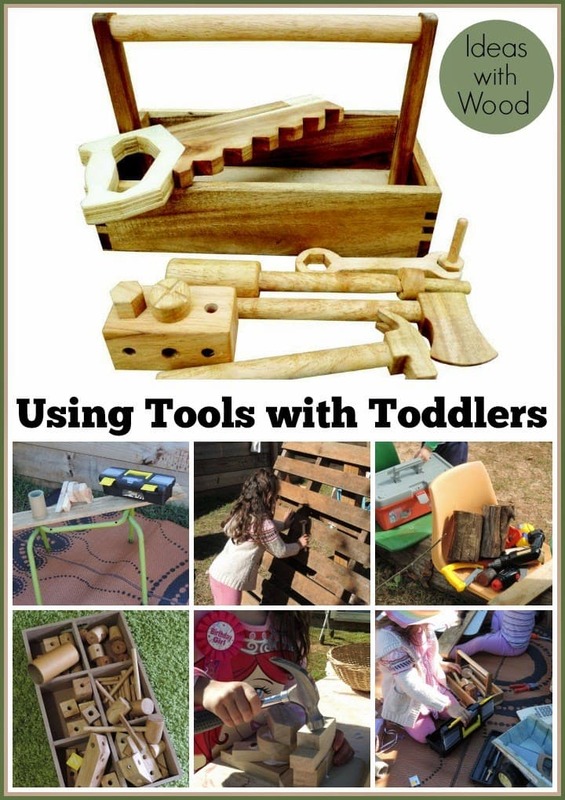 I added real hammers for the older children and wooden hammers for the toddlers…. Why not set up a ‘toolshed’ outdoors? 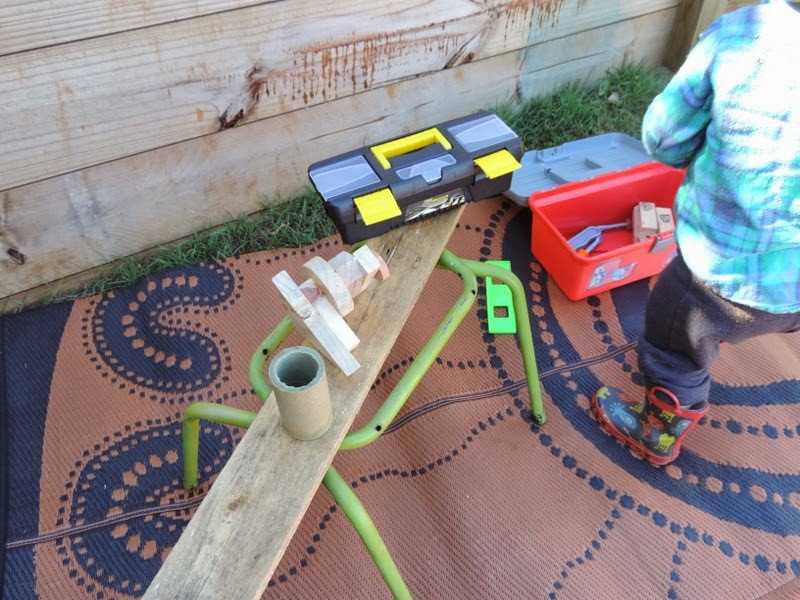 We used our climbing frames as sawhorses, a pallet wall and lots of our favourite tools and wood pieces collected from around the house, this kept the toddlers busy for a whole morning! 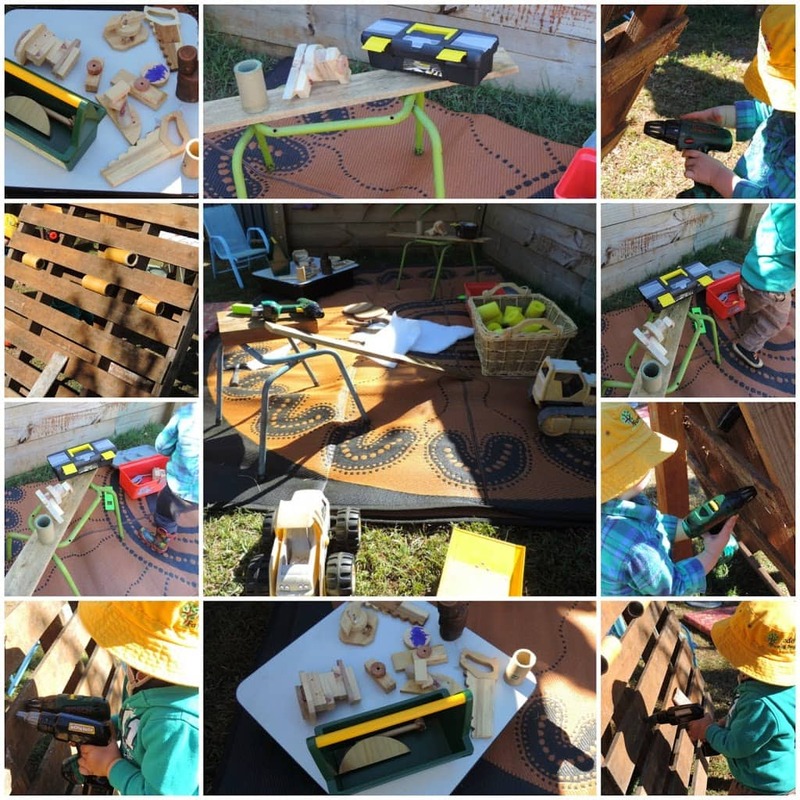 Invite tools and wood into imaginary play and see what the children come up with…on this day our outdoor bus needed some repairs and the wood needed to be transported to ‘the shop’ for building apparently. 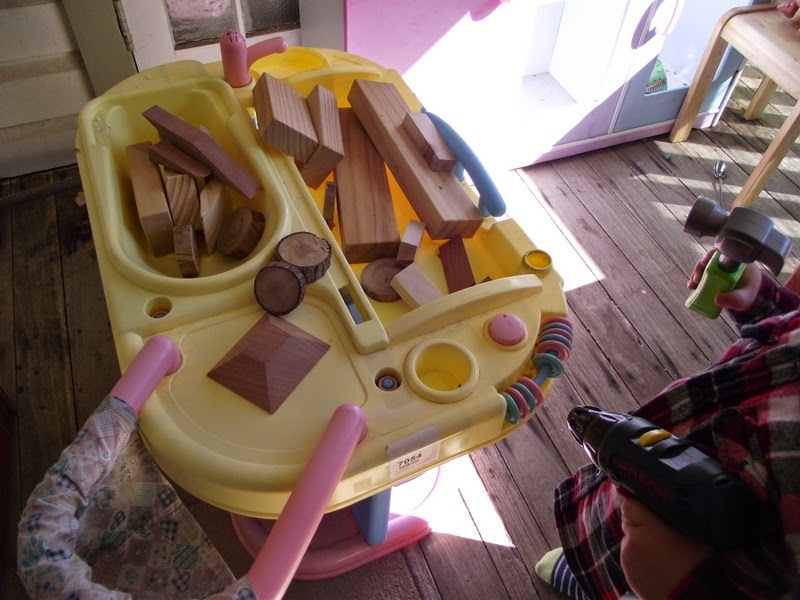 Use what you have to create opportunities for role play and exploration – here we used a baby doll change station as a workbench…. 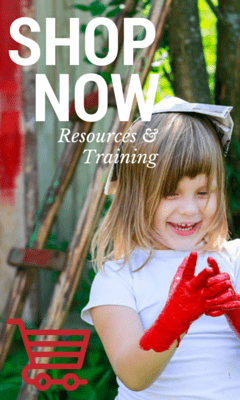 Explore the use of real tools and props from around the yard…toddlers are perfectly capable of working with tools if closely supervised and it provides so many opportunities for learning. On this particular day it lead to a discussion about the indents and patterns the hammers made on the soft wood. 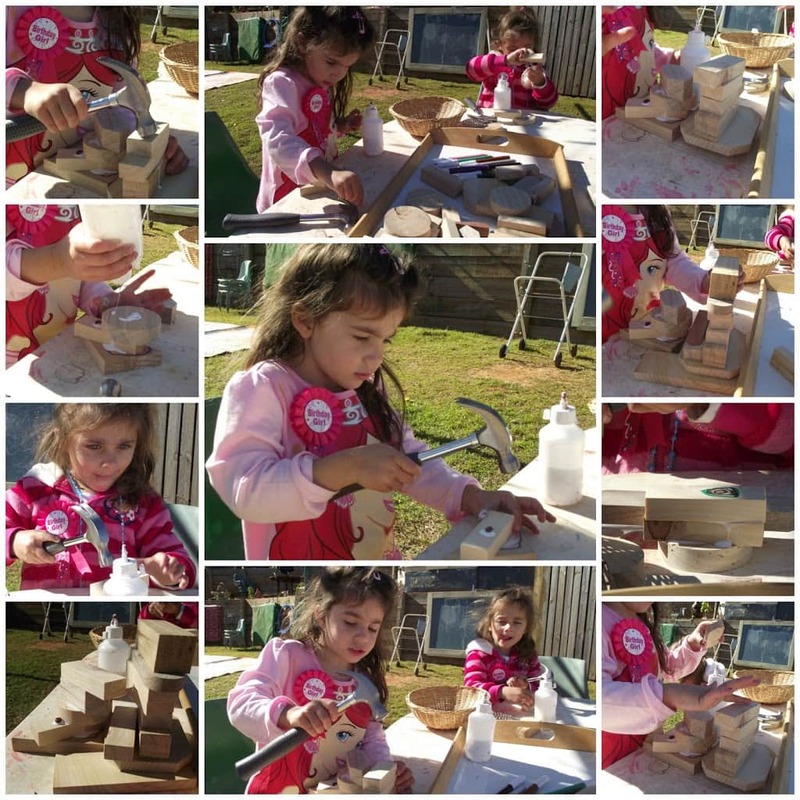 Explore the concept of big and small with the use of natural materials and tools. 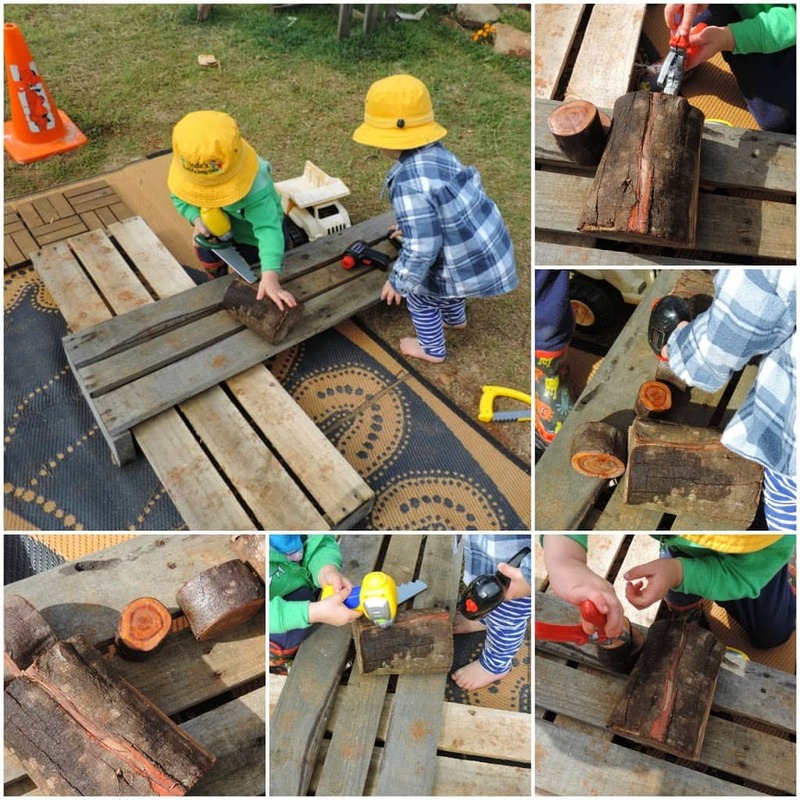 Here the toddlers had lots of fun working with the big logs and we talked about big and small as I introduced the smaller tree blocks. Here are a few pictures of some of my toys and resources from Q Toys that we have been playing with recently (Am really hoping Daddy doesn’t read this 😉 ) They are all available now through Q Toys. 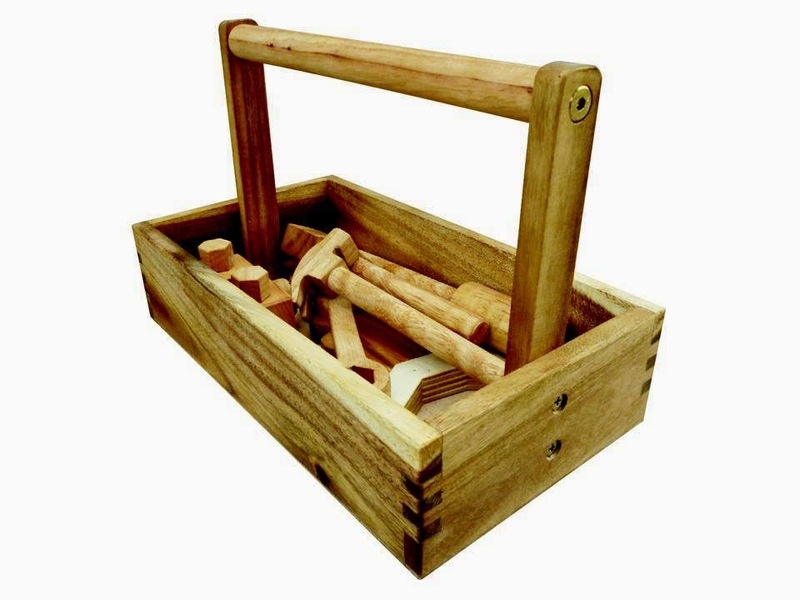 How would you like to own one of these beautiful Q Toys wooden toolboxes ? We absolutely love ours here and my Tara definitely isn’t giving hers up, (she repacks it neatly every day would you believe) but if you head over to the Q Toys Facebook page right now and tag a friend you will get the chance to enter a fantastic giveaway and give your budding builders the opportunity to get creative with their very own wooden toolset. 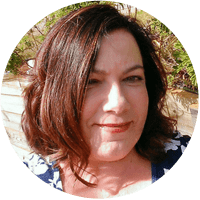 There are 2 up for grabs for lucky readers! COMPETITION NOW CLOSED & WINNER NOTIFIED. Love the offcuts of wood and pva glue play as well. Fun! What fantastic giveaway! love their toys 🙂 We are using a cut off branch as a knitting nancy – hole down the middle and nails on top – works a treat! I want them so bad! I LOVE wood and then I also have three girls that need tools. So perfect for us right now! My now 6 year old was obsessed with construction (and still is) when he was a toddler – hours upon hours spent playing with his “tools”. We’ve just handed down a bunch to his little cousin. This set is gorgeous!